Hummus sandwich and chili at Red Hen Baking Co.
On road trips that start by heading south on the highway from Burlington, our custom is to stop at Red Hen Baking Co. in Middlesex for a baguette and hummus. Many people know about the bakery’s excellent baguette: crusty outside, chewy within, wholesome through and through. But I’m guessing fewer people who make a Red Hen pit stop forego croissants, cookies, pastries or brownies in favor of hummus. The house-made chickpea spread is a favorite of ours: not too smooth, seasoned with garlic, lemon juice, salt and toasted sesame oil — and just right for baguette-dunking on the road. When I ate lunch at the café a few days ago, I turned to my old crush: hummus and bread. The in-house chickpea sandwich is dressed up with olives, pickled red onion, feta cheese and spinach. 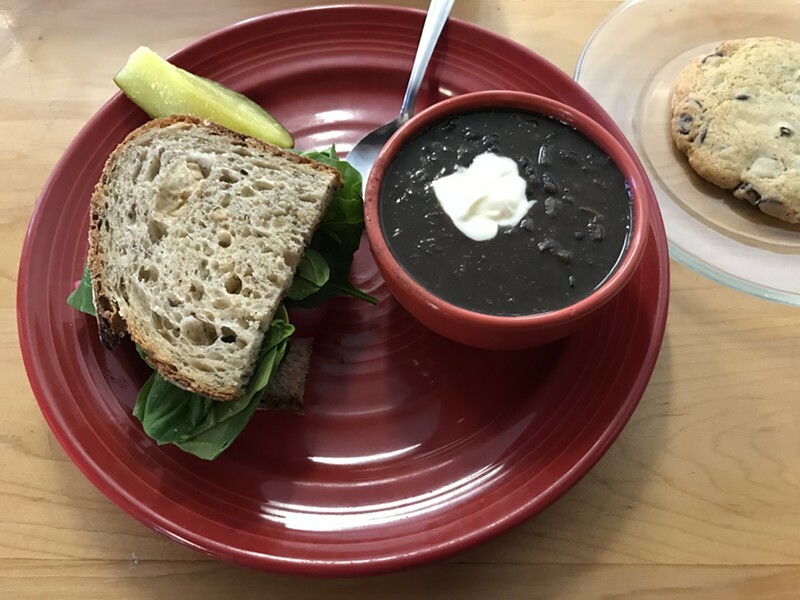 I opted for half a sandwich on Mad River Grain bread and paired it with a cup of black bean chili topped with a spoonful of crème fraiche. Throw in a chocolate chip cookie and I had a three-course meal for $12.11. Blackboard at Red Hen Baking Co. I carried my food to a counter seat with a view of the production bakery, where half a dozen people were making bread. One baker welcomed me to this viewing zone with a wave, and I watched him work at the mixer by the window. After lunch, I noticed a blackboard in the café that illustrates Red Hen’s trajectory since it opened in Duxbury almost 20 years ago. In a recent 10-year stretch, Red Hen baked an estimated 9,360,000 pounds of bread, the sign says. The business has grown from one employee to 45. 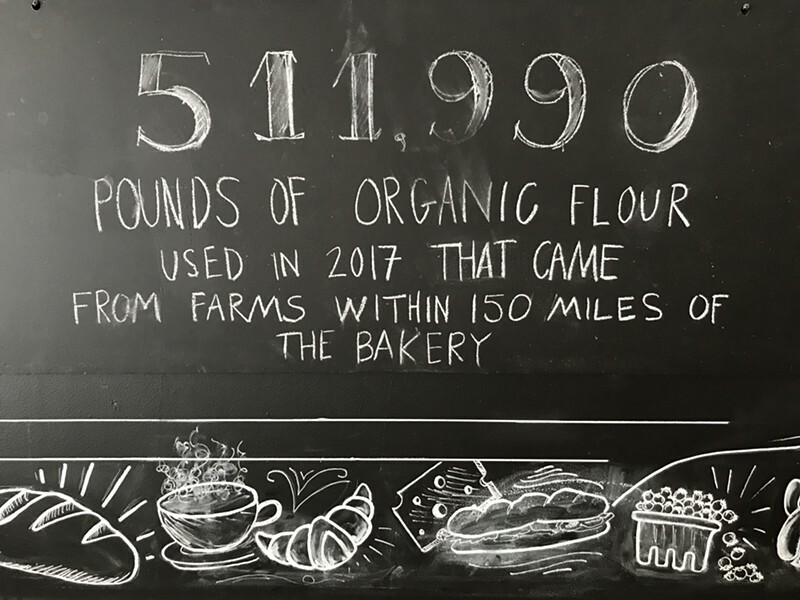 In 2017, Red Hen used 511,990 pounds of organic flour “that came from farms within 150 miles of the bakery." No word on the amount of hummus produced, but a good share of it was consumed by us.